Cranberry & Fig Soap All Natural Handcrafted Soap. 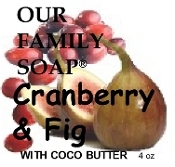 Our classic soap scented with the sweet, scent of cranberries and figs. Generous 4 oz. bar. A combination of saponified olive oil, coconut oil, palm oil, cranberry fig fo. coco butter. and vitamin e.